In spite of rain, mud, mackintoshes, umbrellas, and other prosaic accessories, there was something very impressive about the opening ceremony at the Olympic Games . One felt that it was a privilege to be present at the scene the like of which England has never known before, and cannot see again for another sixty years. It gave one a sense of the continuity of history, a feeling of kinship with the men of old, to watch in the stadium of London , in A.D. 1908, a revival of the famous games at which the athletes of the ancient world competed for the crown of wild olive two thousand years ago. The world is a larger place now than it was in the days of the Greek Olympic games. No fewer than nineteen countries have sent their athletic champions to London to compete at the stadium in the friendly rivalry of sport. The world has grown larger, and it has also grown more peaceful, since the days of Ancient Greece . So much reflection must have passed through the minds of most of those who saw the great international parade of athletes in the stadium on Monday afternoon. Here on the grassy arena were massed the pick of the world's trained athletes, the champions of every country, brought together in peaceful competition by a common love of sport for sport's sake. The fifty thousand spectators  felt that they were witnessing an historic scene, and showed as much by their plaudits. The opening ceremony was most dramatic. No sooner had the King and Queen  taken their seats in the royal box than the band struck up a lively march, and from an entrance on the far side of the great stadium emerged the procession of athletes. They marched in companies, each country under its own national banner, and formed up on the green turf in the centre of the arena. The English-speaking contingents were massed in the centre of the array, with the other nations ranged to left and right in alphabetical order. Then, at a given signal, the entire parade advanced in review order towards the grandstand, the standard bearers in the van of each contingent. At the King's words, "I declare the Olympic games open," a fanfare of trumpets sounded through the arena, and the standard bearers of every nation dipped their ensigns in salute. Followed the national anthem and then three cheers for the King from the two thousand athletes in the arena. The Olympic games were opened. 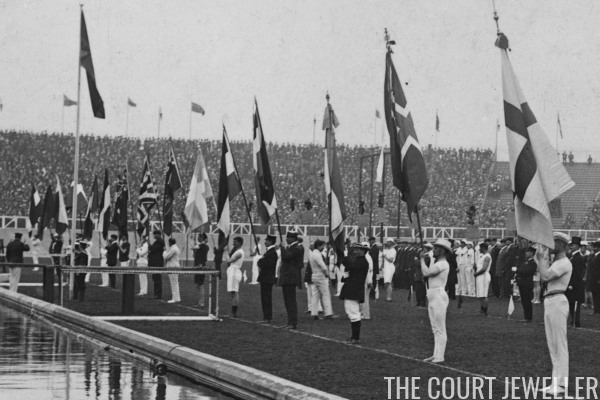 The march-past of the athletes gave the multitude an opportunity to see these world's champions at closer quarters. Austria led the way, by the accident of the alphabet, followed by Belgium, Bohemia, and Denmark. The Danes had a great ovation, and they thoroughly deserved it, for they looked as neat and workmanlike a body as any in the parade. The men were all in white, and at their head marched a score of fair-haired Danish lady gymnasts, in cream jerseys and short skirts, and golden-brown stockings and shoes. They made a brave show and won all hearts. The French and the Dutch came next, and the neat-looking Italians had a special cheer as they marched past in straw hats, black coats, and white knickers. The Norwegian gymnasts, some in white and others in grey, looked a sturdy lot, as also did the Swedes, who were led by half-a-dozen officers in full military uniform . Next came the Finns, in white with blue sashes . The English-speaking contingents brought up the rear, headed by the body of athletes from the United States. The Yankees rather spoiled the symmetry of the effect by wearing ordinary clothes instead of athletic costume, but they had a splendid reception . The Canadians looked very neat in white coats and trousers and white caps, with a red maple leaf over the left breast. The little contingent of Australians and New Zealanders -- about a dozen in all -- were uniformed alike in green jerseys edged with gold and white knickers with black stripe, and the South Africans wore dark green jerseys and knickers. The representatives of the United Kingdom, who were naturally the largest of all the contingents, came last, with a dozen Oxford and Cambridge "blues"  at their head, and a troop of gymnasts in white caps bringing up the rear. Each contingent was preceded by a standard bearer carrying the national flag, and a man bearing a blue entablature with the name of the country in letters of gold. 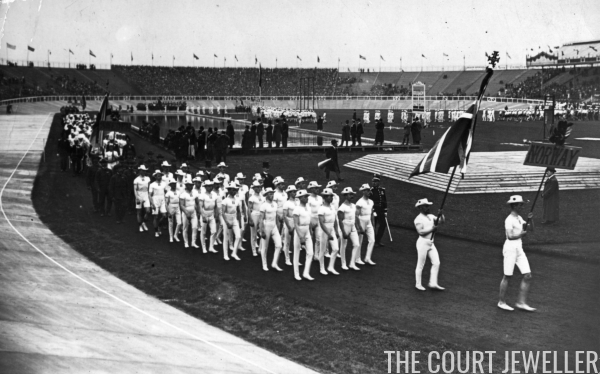 The athletes marched in fours once round the arena, each contingent saluting as it passed the royal box. It was a wonderfully well organized parade, and the effect was extraordinarily impressive. 1. 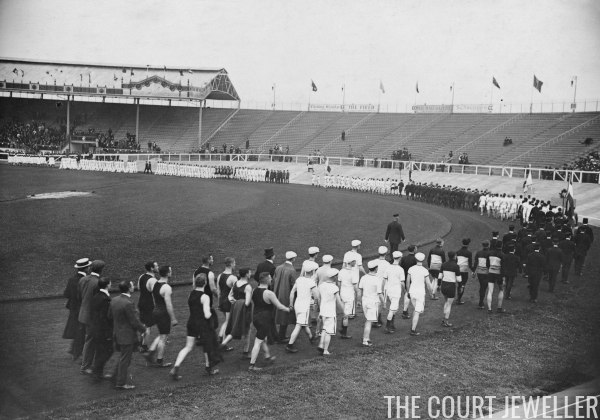 The 1908 Olympic Games were held in London. The Games had originally been scheduled to be contested in Rome, but they had to be shifted to England after Mount Vesuvius erupted in 1906. The eruption killed 100 people and devastated the city of Naples, and the money that had been earmarked for the Games had to be reallocated to rebuilding efforts in Naples. 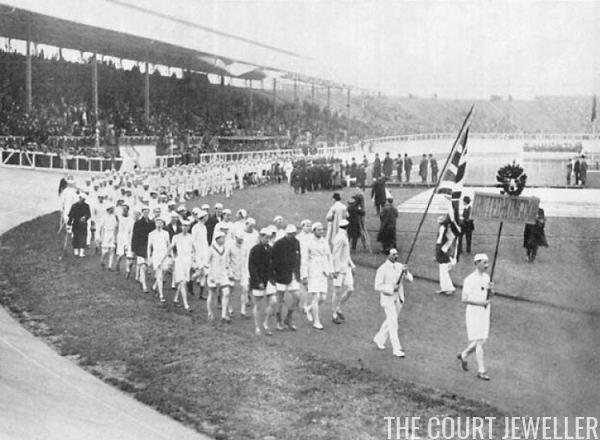 The opening ceremony of the London Games was held on April 27, 1908. 2. The White City Stadium was built for the 1908 Games and stood until 1985. It also hosted a match during the 1966 World Cup. For many years, the stadium was used for greyhound racing. And here's a good bit of trivia: the distance of the modern marathon was officially established at the 1908 Games. 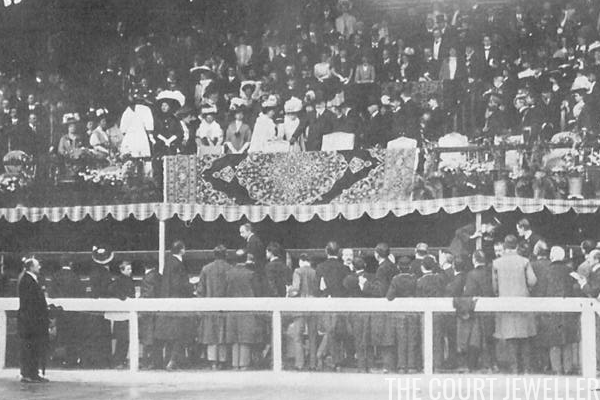 The starting point was at Windsor Castle (just below the nursery window, at the request of Princess Mary); the finish line was inside the stadium, just in front of the royal box (and the king). Remember, marathon runners: you're essentially running from King George VI to King Edward VII when you finish those 26.2! 3. Ah, hindsight. Only six years after these games, World War I broke out in Europe. It was one of the deadliest conflicts in recorded history. 4. White City Stadium held 68,000 spectators in 1908. Curiously, a number of the photographs from the opening ceremony show that large sections of seats in the arena appear to be empty. 5. King Edward VII (1841-1910) and Queen Alexandra (1844-1925) of the United Kingdom, who reigned from 1901-1910. 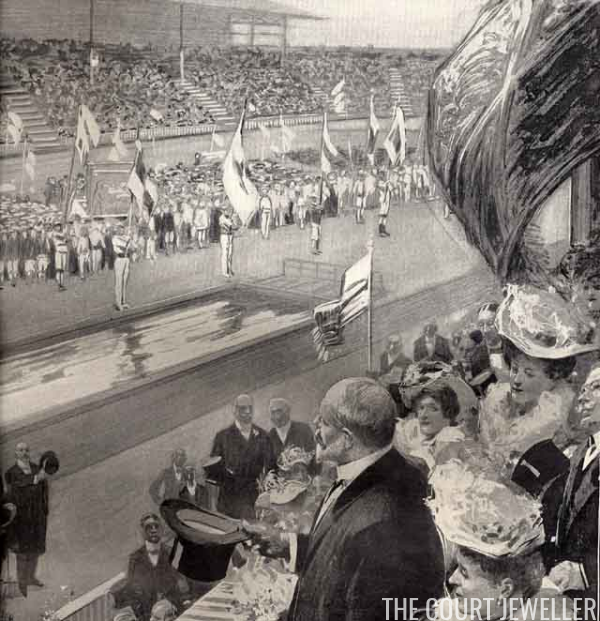 Alexandra stepped into the spotlight during the marathon event at the 1908 Games. Italian runner Dorando Pietri finished first, but he collapsed multiple times after arriving in the stadium and was helped up and redirected by referees; the second-place finisher successfully petitioned for Pietri's disqualification on the grounds that he had received assistance in completing the race. 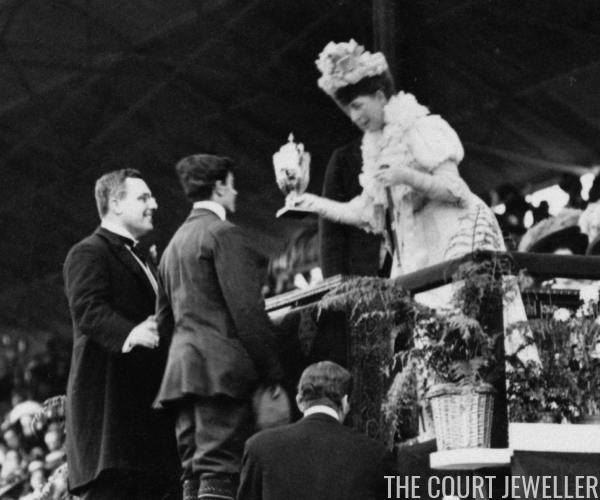 Queen Alexandra was so moved by Pietri's story that she personally presented him with a gilded silver cup the next day to compensate for the gold medal he lost. 6. Some of the Swedish athletes apparently refused to participate in the opening ceremony because their flag had not been displayed above the stadium. 8. Always rebellious, the American athletes did more than just disappoint sartorially. The defiant American flag bearer, Ralph Rose, refused to dip the American flag before the king in the royal box during the parade of athletes. 9. "Blues" are awards earned by athletes at Oxford and Cambridge. There are complicated sets of rules for who gets a blue and the different classifications of blues. Some Australian universities also award blues.